This is a stack of Crappie. Pic was taken in April after a cold front passed. Here is a picture of Stripers in 15 to 20 feet of water. 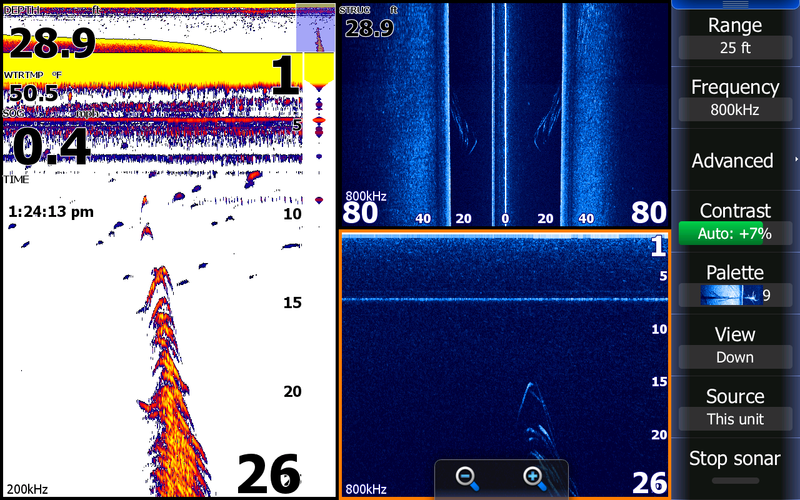 Notice to the left of them on the sonar and downscan pages is a ball of bait. 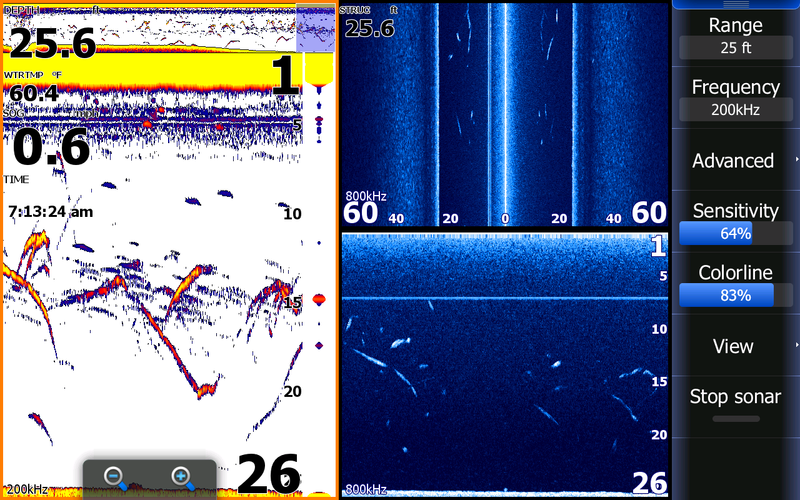 You can also see on the side scan page Stripers off to the right of the boat 40 to 60 feet. This is an example of Stripers feeding. The Stripers are actively "Streaking" as is evident by the trails they are leaving. There are traces of bait in the same part of the water column. 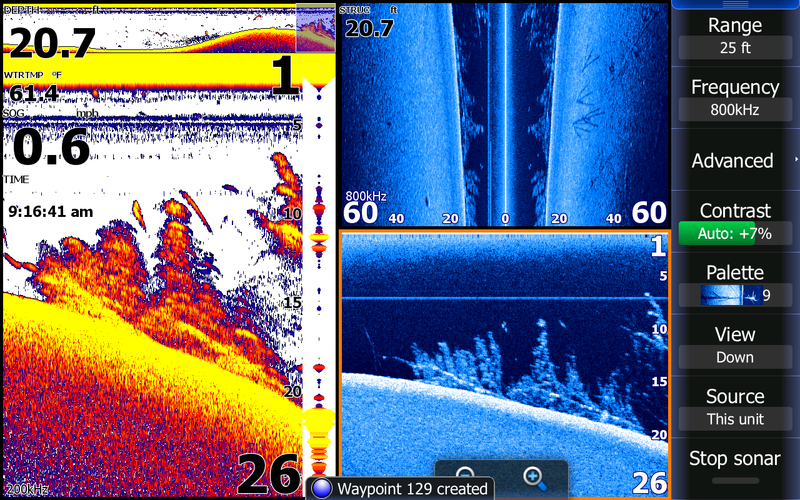 This is a great example of how down scan clearly defines what is under the boat. 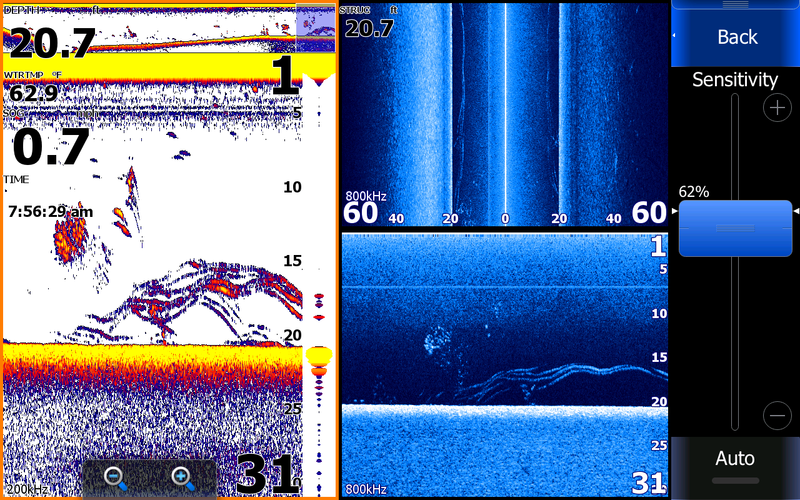 On the sonar page you can see the bottom, see something clustered on and off the bottom rising up about 10 feet with a couple small fish near the top of the structure. Looking at the bottom right [down scan] screen you can clearly see trees laying on their side with limbs protruding upward. Notice the main trunk of the trees about a foot or two paralleling the bottom. Looking at the side scan screen you can see not only the trees under the boat but also trees on the bottom 30 feet to the right of the boat. You can also see that I made a waypoint of structure in which I can return to on another day if I choose to. Lowrance HDS is a technology that every angler can benefit from, I just can't imagine a fisherman that fishes the lake not utilizing this kind of information to improve their catches. Stop by Greentop Sporting Goods and check out the Lowrance HDS products, could be the difference in going fishing or Catching!